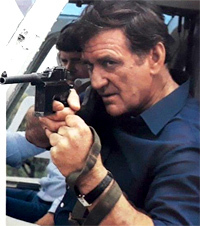 Rod Taylor plays Mr. Payatta, a professional hit man who travels the world to take out notorious bad guys then returns quietly to his rural Australian home. 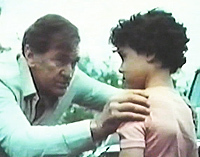 It is one of the rare occasions that Rod played an Australian in an Australian movie. "On the Run" -- also known as "Nowhere to Hide" -- opens with Payatta putting a bullet into the head of a good guy for a change. He returns home and is greeted warmly by all the townsfolk, who have no idea about his this "other" career. They know him only as a pillar of their community, where he runs a successful horse ranch. Rod had this to say about his character in Australia's TV Week magazine, April 17, 1982: "To his neighbors, he's a respected gentleman farmer. He's well-educated and speaks several languages. But he's also a cold, ruthless contract killer who receives $300,000 for each hit." The only one who knows better is Harry (Paul Winfield), who Payatta pays to work with his horses and keep his secrets. Harry has secrets of his own to keep, too -- he is an escaped convict, a fugitive from the United States. Into this mix enters Paul (Beau Cox), a 10-year-old French orphan who apparently is Payatta's nephew. A few years earlier, Cox became the youngest-ever TV Week Logie winner when he received the 1978 TV Week Logie for "outstanding performance by a juvenile" for his performance in a series called "Young Ramsay." When the boy sees Payatta kill two blackmailers (who have photographs of Payatta carrying out his latest hit), the "on the run" portion of the movie begins. Harry takes Paul away to protect him, with Payatta giving chase. The natural warmth that Taylor exudes has always made it hard to accept him in villainous roles. There's a spark of menace toward the end of "On the Run," in the final scenes of confrontation, but this may be one of Taylor's most unconvincing attempts at playing the heavy. In the 1982 TV Week article, Rod said the movie made him feel young again. "I seem to be doing all the outrageous stunts I used to do when I was 20 years younger." In fact, the article noted, "Just last week, Taylor was hanging off a helicopter in the Blue Mountains and taking part in high speed car chases." Despite Taylor's top billing and central part in the plot, the film is focused on the bonding between Harry and Paul as they attempt to flee Payatta. Because the boy speaks no English, the "conversation" between the two is actually a monologue, as Harry recalls his past and examines his character. 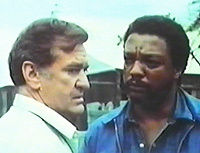 Fans looking for a Rod Taylor film will find that this is much more a Paul Winfield vehicle. 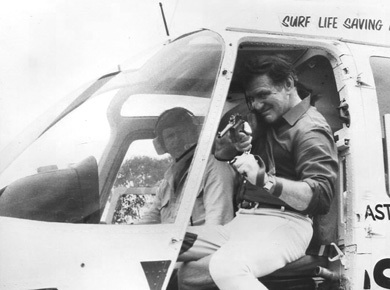 In "Rod Taylor: An Aussie in Hollywood," author Stephen Vagg wrote that "On the Run" was never intended to have a theatrical release, according to Richard Hindley, the movie's editor. Hindley said the director, Mende Brown, was "very television." The movie had one screening at a Bondi theater to qualify for a tax concession before it was sold to television.